A gastroparesis meal is one that is small (1 to 1 ½ cups of food), almost like a snack, and is low in fat and fiber. It is easy to rely too much on nutrient poor foods such as white breads, pastas, crackers, chips, and sweets when fiber is lowered. Below are convenient nutritious mini meal ideas and simple recipes appropriate for those with mild to moderate gastroparesis . Blend ½ of a frozen banana, ½ cup unsweetened vanilla almond milk and 1 Tbsp. protein powder or PB2. Enjoy! Top ½ cup plain or vanilla Greek yogurt with ½ cup canned fruit in its own juice, drained and ¼ cup cheerios. Enjoy baked egg muffins filled with cooked spinach and low fat shredded cheese. Make a batch to store in the fridge for breakfast or snacks throughout the week. Fill a 6in. tortilla with a scrambled egg or 2 egg whites and 1 Tbsp. shredded low fat cheese and 1 Tbsp. mild salsa. Top a small baked potato (don’t eat the skin) with 1 Tbsp. chives, 2 Tbsp. chopped tomatoes, 2 Tbsp. reduced fat shredded cheese and 2 Tbsp. nonfat plain Greek yogurt. Enjoy ¾ cup low fat cottage cheese with ½ cup fruit canned in its own juice or soft melons or sliced tomato. Mix 1 can or packet of light tuna in water with a light salad dressing or light mayo and mustard. Enjoy wrapped in lettuce cups or on low fiber enriched bread. Enjoy a cup of low sodium chicken, noodle, and vegetable soup (small pieces of chopped carrots, green beans, and celery ok) with low fiber crackers. Top ½ cup cooked white rice with ½ cup cooked and chopped moist chicken breast, ½ cup cooked shredded carrots and zucchini, and a drizzle of teriyaki sauce. Enjoy a small grilled lean burger with a side of roasted zucchini (skin peeled). Enjoy soft corn tortillas topped with flavorful shredded lean pork, diced tomatoes, and a sprinkle of cheese. Enjoy flaky white fish and tender vegetables cooked together in a single serve packet. 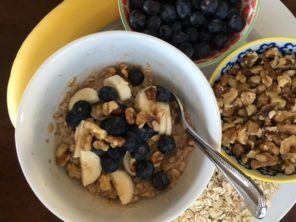 This oatmeal is a great way to start your day! The balance of protein, carbs, and fat and high fiber content will help satisfy you, regulate your blood sugars, and give you energy. There are no added sugars and overall are very low in natural sugars. Only takes a few minutes to make and tastes delicious! In microwaveable bowl whisk egg, liquid, oats and quinoa flakes until combined. Microwave for two minutes or until the middle of the oatmeal is set. Remove from microwave and top with additional ingredients from the options above or try your own combination. Enjoy! April was IBS (Irritable Bowel Syndrome) awareness month. Let’s continue the awareness and support beyond April! Have you been told to eat 5 to 6 small meals throughout the day? Increase your fiber? Avoid gassy foods? Follow a low FODMAP diet? This might seem like a time consuming unachievable task, but let me help you! Below are low FODMAP “mini meals” incorporating a moderate amount of fiber with less gassy foods AND they are simple to prepare! Combine 1 cup plain or multigrain cheerios with ½ cup blueberries, 2 Tbsp. chopped walnuts, and unsweetened vanilla almond milk in bowl. Sauté 1 cup chopped veggies (such as zucchini, bell peppers, spinach leaves) in skillet. Set aside. Scramble 1-2 eggs in skillet. Toss veggies and eggs together, season with dried herbs and pepper, and sprinkle with 2 Tbsp. cheddar cheese. Spread 2 rice cakes each with 1 Tbsp. peanut butter and small banana sliced on top with a sprinkle of cinnamon. Top your toast (Ex: Udi’s whole grain gluten free bread)! 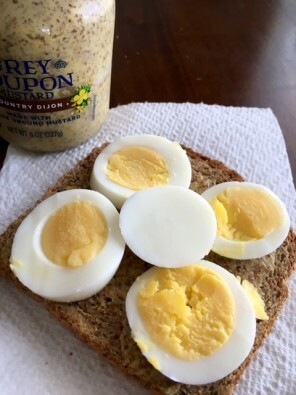 Spread with Dijon mustard, hard-boiled egg, and tomato sliced on top. 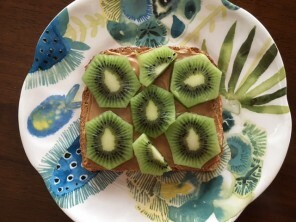 Spread with peanut butter and slice kiwi on top. Mix 1 tuna packet with 1-2 Tbsp. olive oil mayo, ½ cup chopped celery and carrots and enjoy with Blue Diamond nut thin crackers. Enjoy a cheddar and chicken corn tortilla sandwich. Cook 1 small potato (white or sweet) in microwave. Top with ½ cup steamed broccoli, sprinkle salt and pepper, add shredded cheddar cheese, and 2 dollops plain Greek yogurt. Eat the skin for more fiber! Heat individual brown rice cup in microwave. Top with steamed veggies (squash, zucchini, carrots, bell peppers), 1 scrambled egg, and soy sauce. Enjoy a blueberry kale salad. Why create a healthy eating environment? Our daily food and beverage choices are largely impacted by what we surround ourselves with, what is visible and easily accessible to us. If healthy foods are more visible and accessible than unhealthy options, we are more likely to choose the healthy options and vice versa. Although we can’t control our environment 100 percent, there are steps we can take to create a healthier eating environment and achieve our health goals. Implement the tips below. Have healthy foods available at home. Keep unhealthy foods out of the house. Go through your kitchen fridge, freezer, pantry, cabinets, and counters and get rid of unhealthy food items that aren’t helping you meet your weight and health goals. Go grocery shopping and stock your kitchen with healthy items from each food group. Use this guide to help! Discuss the changes with family members. If family members want unhealthy foods you are not wanting, have a separate cabinet or drawer for them. Have a healthy snack available when you are on the go. Avoid stopping at fast food or a gas station for a snack. 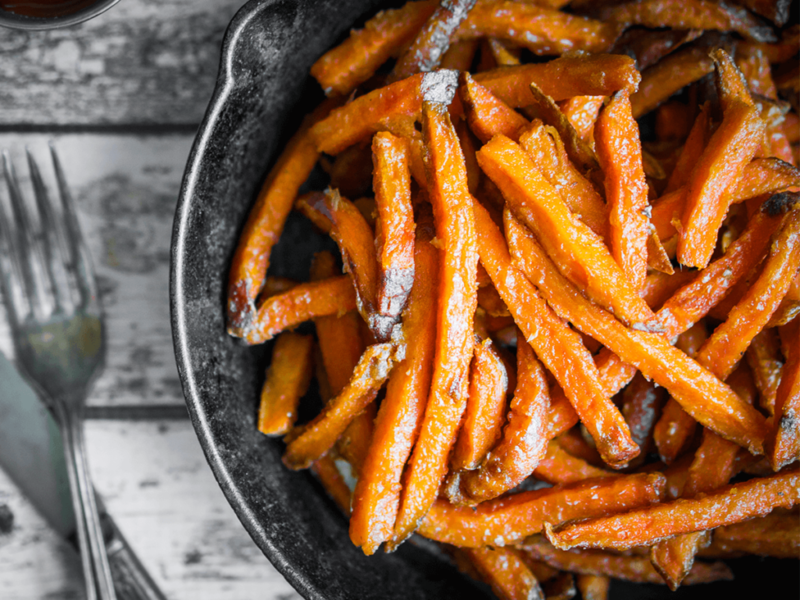 Get in habit of throwing one healthy snack in your bag before going out the door. Have a healthy snack basket near the door. Have individual healthy snacks available in your car. Use this guide for snack ideas! Create a healthy environment at work. 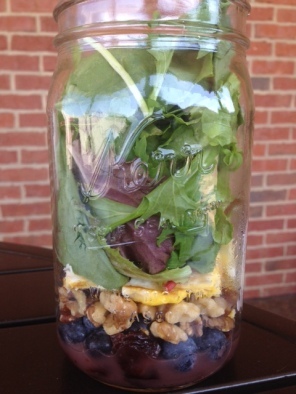 Pack a healthy lunch instead of relying on eating out or carry-ins. On breaks, stay out of the break room as much as possible where tempting foods may be available, and take a walk instead. Remove unhealthy snacks from your drawers. Have one to two healthy snacks available at your work area or in fridge. Eat out less. Avoid eating out at restaurants that you are tempted to get an unhealthy option and save them for special occasions. Make a goal (with family, friends, or co-workers) for eating out 1 time per week. Plan to go to restaurants where you choose healthier options. Make large batches of healthy meals so you can utilize leftovers for meals throughout the week. Keep convenient healthy foods stocked up at home so you can quickly throw together a nutritious meal. Have healthy beverages within reach. Avoid stopping by fast food or a gas station to pick up a large high calorie beverage. Get a fun water bottle, coffee, or tea mug. Have water, black coffee, unsweetened tea, or fruit infused water available. Tell people around you about your healthy eating environment goals so that they can help support you. This one week meal plan is an example of how you can easily prepare and eat whole nutritious foods. There aren’t specific serving sizes and calories listed. Instead, try to make half of what you put on your plate vegetables and fruits, one fourth proteins, and one fourth grains or starches. Practice mindful eating as often as you can by setting time aside to eat and enjoy your meal, paying attention to your hunger and fullness. Berry Banana Nut Oatmeal: In a microwave safe bowl combine ½ cup old fashioned oats, frozen berries, banana slices, chopped nuts, and 1 cup unsweetened vanilla almond milk. Microwave for 2 minutes. Let cool slightly, stir, and enjoy. Glass of water. Coffee or tea if desired. California Chicken Pita: Place baked Italian chicken breast in a whole grain pita, spread with 1/4 smashed avocado and add tomato slices. Enjoy with carrots and hummus. Glass of water. Celery sticks with peanut butter. Glass of water. Vegetarian Stir Fry: Cook instant brown rice according to package directions, drizzle with teriyaki sauce, stir, and let sit covered. In skillet, sauté frozen bag of stir fry veggies and edamame, drizzle with teriyaki sauce. Top veggie mixture over rice. Enjoy with a glass of unsweetened vanilla almond milk. Easy egg pita: Cook egg in skillet or slice a pre-cooked hardboiled egg and place in whole grain pita, add spinach leaves and spread with ¼ smashed avocado. Enjoy with a glass of unsweetened vanilla almond milk. Grab-n-Go: Dip celery sticks in natural peanut butter and enjoy plain Greek yogurt with sliced banana. Glass of water. Carrots and hummus. Glass of water. Balanced Plate: Reheat baked Italian chicken breast. Microwave sweet potato, drizzle with olive oil, and sprinkle with cinnamon. Steam frozen veggie on stovetop, season with salt and pepper. Glass of water. Fruit and Nut Yogurt: In a to-go container, add plain Greek yogurt, top with fruit and nuts. Glass of water. Tuna salad: Top a bed of spinach leaves with tuna, carrots, tomato, and drizzle with light Italian dressing. Enjoy with pita wedges and hummus. Glass of water. 1 small banana with peanut butter. Glass of water. Vegetable omelet: Sauté variety of vegetables in skillet with olive oil, remove. Whisk eggs and add to skillet, cook until bottom is lightly browned and sides start to set, add veggies, fold in half and continue to cook until done. Enjoy with pita triangles dipped in olive oil. Glass of unsweetened vanilla almond milk. Egg Boost Oatmeal: In a microwave safe bowl combine ½ cup old fashioned oats, banana slices, 1 whisked egg, cinnamon, and ½ cup unsweetened vanilla almond milk. Microwave for 2 minutes. Let cool slightly and enjoy. Glass of water. Hummus Pizza Pita: Spread hummus on a whole grain pita. Top with chopped chicken breast, diced avocado, diced tomatoes, and drizzle with light Italian dressing. Enjoy with Greek yogurt and berries. Glass of water. Vegetarian Stir Fry: Cook instant brown rice according to package directions, drizzle with teriyaki sauce, stir, and let sit covered. In skillet sauté frozen bag of stir fry veggies and edamame, drizzle with teriyaki sauce. Enjoy veggie mixture on top of rice. Enjoy with a glass of unsweetened vanilla almond milk. Easy egg pita: Cook egg in skillet or slice a precooked hardboiled egg and place in whole grain pita, add spinach leaves and spread with ¼ smashed avocado. Enjoy with a glass of unsweetened vanilla almond milk. Tuna salad: Top a bed of spinach leaves with tuna, avocado, tomato, and drizzle with light Italian dressing. Enjoy with plain Greek yogurt with sliced banana. Glass of water. Balanced Plate: Reheat baked Italian chicken breast, bake homemade sweet potato fries (cut sweet potato, drizzle with olive oil, sprinkle with cinnamon, and salt. Bake at 425 degrees for 15 minutes). Steam frozen veggie on stovetop, season with salt and pepper. Glass of water. Bake 4 or more chicken breasts for the week. Marinate in light Italian salad dressing at least 1 hour in fridge. Bake at 400 degrees until juices run clear and no longer pink about 30 minutes. Slice tomatoes, cut celery, and put in containers in fridge. Hard boil a few eggs. Place eggs and cool water in pot with just enough water to cover eggs. Heat on stovetop until boiling. Once boiling turn off burner, remove pot, cover, and let sit 11 minutes. Drain water and cool eggs in fridge. Colorectal Cancer is the third most commonly diagnosed cancer and the third leading cause of cancer death in both men and women (American Cancer Society). Increase your fiber intake from whole grains rather than refined white grains. What are whole grains and what are refined grains? Whole grains contain each part of the grain (bran, endosperm, and germ) with all of their nutrients. They include oats, brown or wild rice, whole wheat bread or pasta. Refined grains are those that have had parts of the grain and therefore some of the nutrients removed. Some examples are white bread, white rice, and pasta. How much fiber? Women should consume 25 or more grams per day. Men should consume 31 or more grams per day. You can meet your fiber recommendations by eating at least three servings of fruits and four servings of vegetables and making your grain choices whole grains daily. Legumes such beans and lentils are also high in fiber. What is red meat? All mammalian muscle meat including beef, veal, pork, lamb, mutton, horse and goat (IARC/WHO). How much red meat? There are no recommendations on exactly how much red meat is ok. In general, avoid eating red meat on a daily basis. Aim for once a week, if any. What can I eat for protein instead of red meat? Chicken, turkey, fish such as salmon and tuna, eggs, Greek yogurt, milk, nuts, peanut butter, beans, and soy. What is a processed meat? Meat that has been transformed through salting, curing, fermenting, smoking, or other processes to enhance flavor or improve preservation. Examples include hot dogs, ham, sausages, corned beef, beef jerky, and canned meat (IARC/WHO). How much processed meat? There are no recommendations on exactly how much processed meat is ok. In general, avoid it as much as possible. Which fruits and vegetables are best? A variety of dark and brightly colored fruits and vegetables such as spinach, tomatoes, orange and red bell peppers, berries, etc. What about frozen and canned? Frozen can be just as or more nutritious than fresh. Canned may be slightly lower in nutrients and may have a lot of added sugar or salt but can still be beneficial. Try the recipes below to help incorporate these recommendations. Homemade breakfast sandwich: Top a whole grain English muffin with a cooked egg, handful of baby spinach, a couple tomato slices, and sharp cheddar cheese. California chicken wrap: In a whole grain tortilla wrap 2oz. sliced chicken breast, handful of mixed greens, ¼ sliced avocado, 1 Tbsp. dried cranberries, and a spread of hummus or light cream cheese. 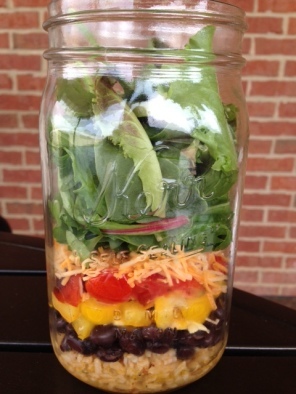 Salad in a mason jar is a convenient fun way to pack a salad for lunch! It pours out perfectly into a bowl when you are ready to enjoy. Use the tips below to layer your salad for the best results. 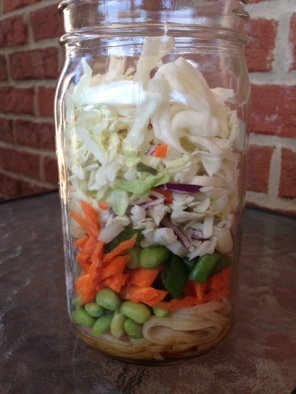 Layer 1: In the bottom of your mason jar, pour 2 Tbsp. light salad dressing. Layer 2: Next, add the ingredients that can absorb the salad dressing and won’t wilt or get soggy from it. Layer 3: Then, layer the rest of the toppings. 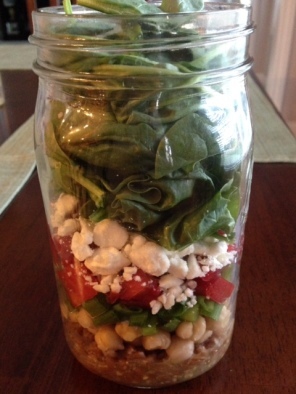 Layer 4: Fill the top of jar with the salad greens. That way your salad greens will stay fresh and when you pour it in your bowl all your toppings will be on TOP! The salad recipes below are great for you GI health because they are high in fiber to help keep you regular, high in phytochemicals to help reduce inflammation, and most are or can be modified to fit special diets such as low FODMAP or gluten free. Eating breakfast can help stabilize hunger for the entire day, especially if it includes protein. Protein reduces ghrelin (hormone that tells us we are hungry) levels best and generally increases leptin activity (hormone that decreases food intake and regulates energy metabolism). Some of the best ghrelin suppressing foods are: skinless poultry, lean beef, fish, eggs, and fat-free Greek yogurt. 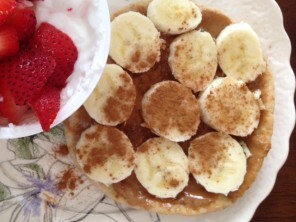 There is no need to overload on protein at breakfast. Stick with one to three ounce equivalents. 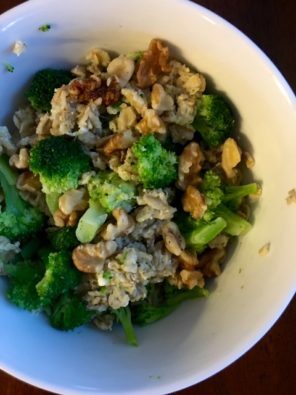 1 ounce of each food is: 1 ounce cooked lean meat, 1 egg, 1 tablespoon peanut or almond butter, 1/8 cup nuts, 6 ounces Greek yogurt, ¼ cup low fat cottage cheese, or 8 ounces low fat milk. Cottage cheese topped with your favorite fruit and nuts. Cottage cheese with the delicious flavor combination of cinnamon, vanilla, and peaches. A banana bread inspired smoothie. A Greek yogurt parfait topped with juicy berries and granola. A kefir smoothie blended with your favorite fruit and extra fiber, healthy fat, and protein from ground flaxseeds. 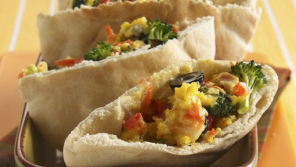 A scrambled egg and veggie pocket for a convenient hearty breakfast. Omelet muffins. Enjoy any type of omelet you desire in a convenient muffin that only takes seconds to heat and enjoy for a quick high protein, low carb breakfast. Egg-boost oatmeal topped with Greek yogurt. Amp up the protein in your oatmeal by adding an egg and Greek yogurt. Almond butter spread on sprouted grain bread topped with berries. 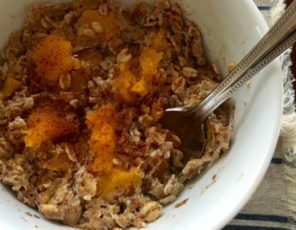 Almond-packed oatmeal filled with almond butter, almond milk, and slivered almonds. Peanut butter blended into a smoothie.